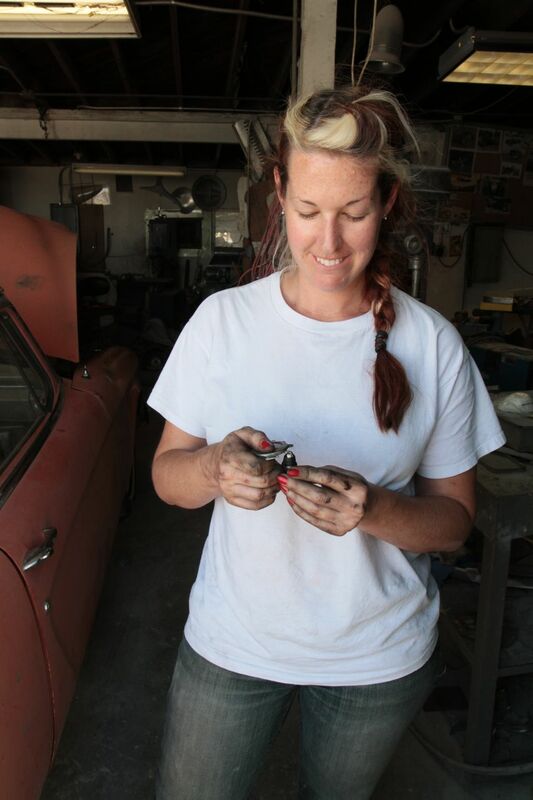 I’ve known for awhile that I needed to change the spark plugs in my Studebaker. But I’d heard things. Things like you could break the plug inside your motor if you did it wrong and to be sure to tighten the plugs to the correct tension. So although I knew they should be changed, I was scared to do it on my own, and my spark plugs in there were working…right??? As I’m learning, I’m seeing that spark plugs (although they don’t cost much and are small little things) are a major, MAJOR component of your engine. Without ’em, your engine wouldn’t run. Without ’em working at their best, your engine won’t run at its best. 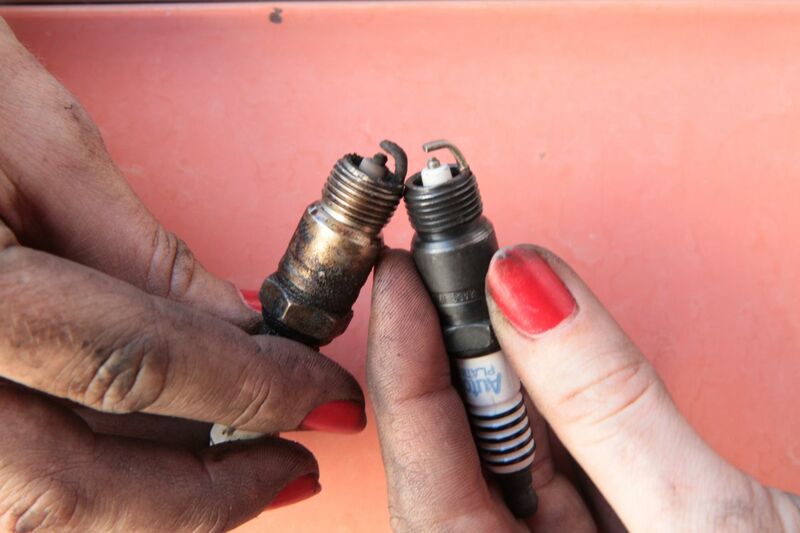 So as part of last weekend’s wrenching adventure up at Gene Winfield’s in Mojave, I changed my spark plugs…for the very first time! Gasp! The fellow at the local parts store recommended Autolite over ACDelco plugs which I had been running. Then, when he informed me the gap for my application was .052 I was surprised, and a little confused. Gap…what?!? 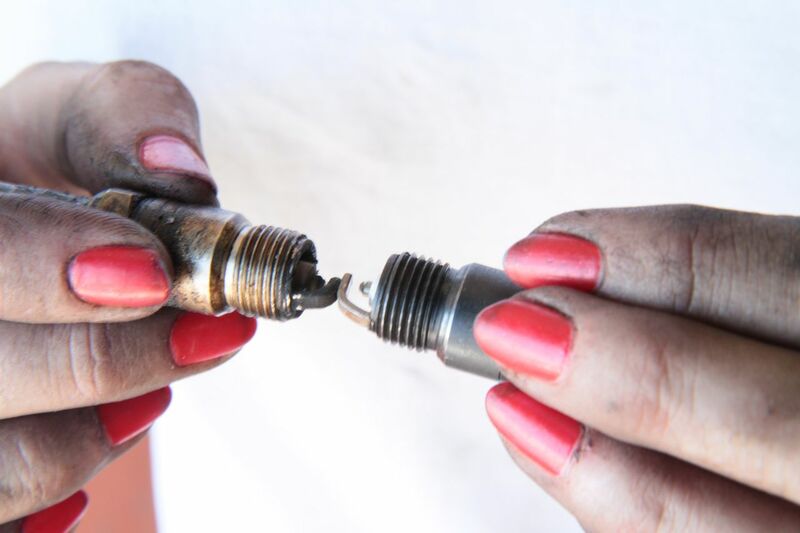 While perhaps some people just throw a set of spark plugs in their engine – if you want your engine to run at its best, you’ve got to adjust the spark plug gap prior to putting them in. 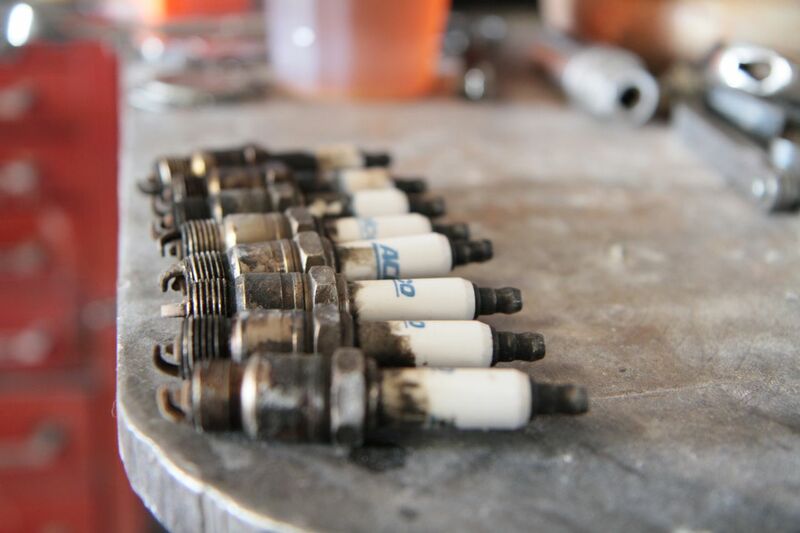 So what is a spark plug gap and how do you set it? The gap is referring to the space between the center electrode (that comes up out of the middle) and the ground electrode (that curves around the top). This space is measured using a special measuring tool. The most common tool you’d find to do this is called a taper gap gauge – and is that silver-dollar looking thing you often find by the register in auto parts store. The edge of that “coin” is tapered and its thickness corresponds with the numbers engraved on the top and bottom. Many people feel, although this is a simple tool, that a different style of tool works better – which is the one I used and pictured here. Rather than being tapered its got different thicknesses of wire. So although my tool didn’t have a .052 inch wire thickness, it did have a .050 and a .054. So we used it by determining that the .050 easily slid between the two electrodes and the .054 would not fit between them. 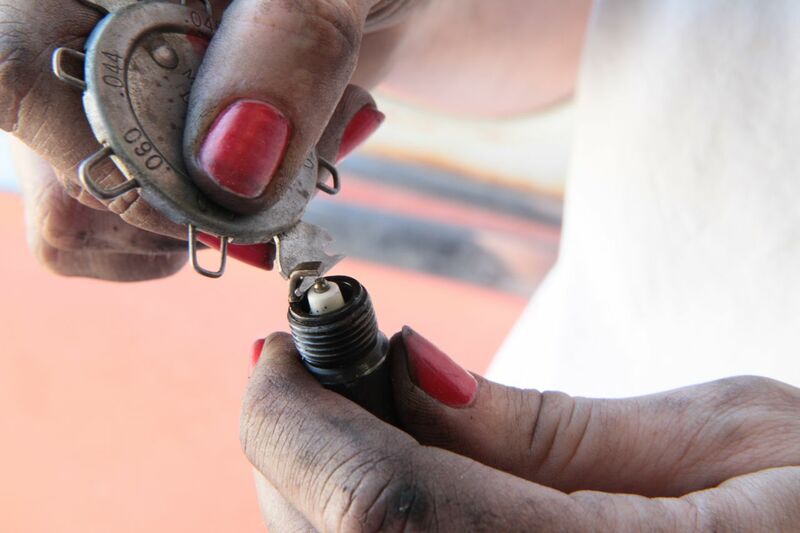 As we adjusted the gap in each spark plug, sometimes the ground electrode would have to be pulled up to widen the gap and other times it would have to be pushed down slightly to shrink the gap. When you’re adjusting the ground electrode, be sure that you don’t hit or press against the center electrode. It only takes a little bit of pressure to move it – so after a little pressure use your tool to check the gap again until you’ve got the perfect fit! Who knew such a simple thing could make such a big difference? I certainly didn’t. I’d imagine this was one of the easiest things I could do (without even getting my hands too greasy) to make my engine run better. Sparkin! 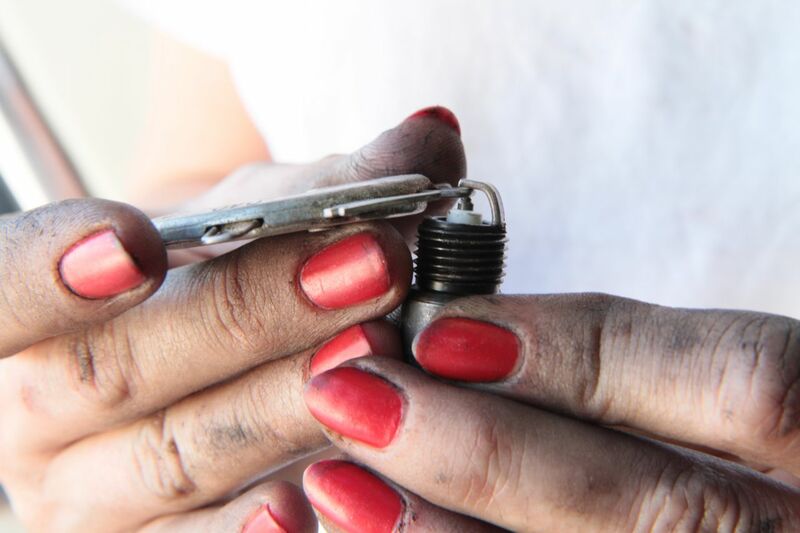 Have your kids change the spark plugs with you! As for the photo…I’m sure you’ll all recognize these are way better then my usual (and keep an eye out for the next posting too)! I’ve got to give all the credit to my co-car club pal, Lori for all the photos. You can check into her more at http://www.motordolls.com! Maybe I’m a little biased, but this was really well done. Informative. Entertaining. And well-written. Thanks, Grease Girl! Nice job! This sort how-to info is great for people to get their hands on. I bet Stude starts and runs a little smoother with her new plugs now. This is called “reading the plugs” and can give you an early warning of something going wrong inside your engine. Nice work, Kristin! 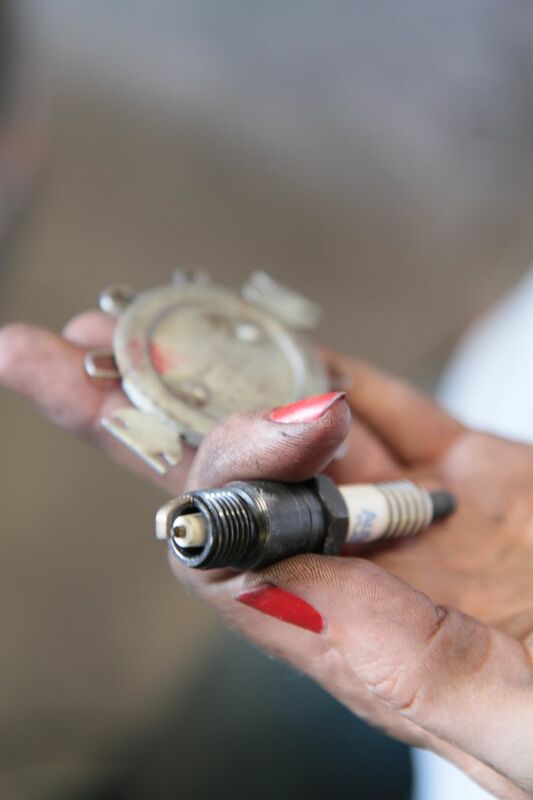 Keep on wrenching. Great resource, Gear Head Skeptic!! It really helps to see an example and the reason why it looks the way it does. That’s a fantastic link Gear Head Skeptic…thanks so much! I thought a couple of my old plugs looked pretty bad, but nothing like the ones pictured on the “reading chart”. I just changed the plugs on my ’56 and while setting the gap, I pressed too hard and the ground electrode touched the center electrode. I spread it out to the correct gap .035 in my case, and it seems to run great. What can happen when they touch? If the two touch while you’re messing with the gap it’s no big deal…it won’t mess anything up. Just make sure the electrode isn’t damaged/cracked by getting bent too much! Glad to see you getting your hands dirty Tony! Thanks Kristin! I’m inspired by your posts and your club.